Byrd Law — Heritage Wine Cellars, LTD. The lobby remains powerful to this day this Amendment remains the only one ever ratified in this manner. TWSRA V BLAIR: Will it be another Janus? The supreme court can decide to rule narrowly on the below issue (only on residency requirements – or the standing of the case) or they can draft an opinion with more far reaching consequences. Issue: Whether the 21st Amendment empowers states, consistent with the dormant commerce clause, to regulate liquor sales by granting retail or wholesale licenses only to individuals or entitles that have resided in-state for a specified time. Granholm and Michigan Beer challenged Michigan regulations, while Swedenburg challenged a New York rule on interstate shipment of wine. 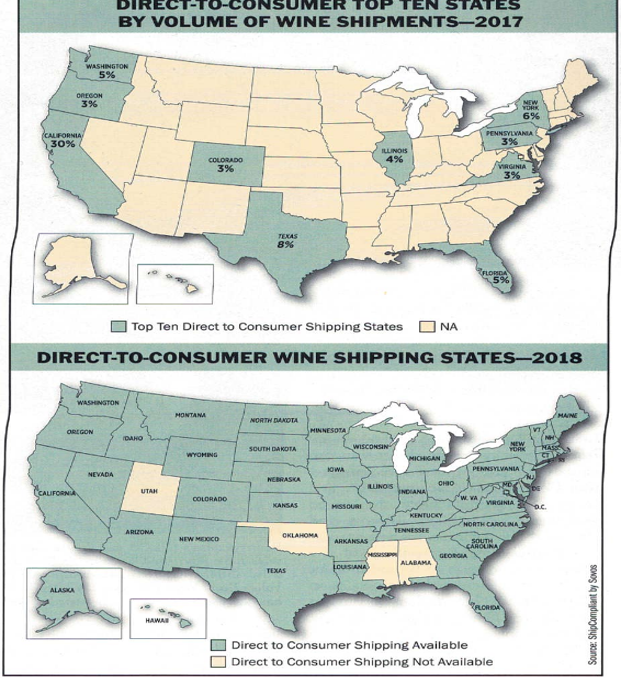 The consolidated cases presented the same question: "Does a State’s regulatory scheme that permits in-state wineries directly to ship alcohol to consumers but restricts the ability of out-of-state wineries to do so violate the dormant Commerce Clause in light of §2 of the Twenty-first Amendment?" MEANING…$100,000,000 on which you could be making commission!!!! John Paul Stevens had a great regard for Judicial Precedent and his concurrence in Thomas dissent shouldn’t be taken lightly - A 2003 statistical analysis of Supreme Court voting patterns found Stevens the most liberal member of the Court. “Today’s decision may represent sound economic policy and may be consistent with the policy choices of the contemporaries of Adam Smith who drafted our original Constitution;4 it is not, however, consistent with the policy choices made by those who amended our Constitution in 1919 and 1933. My understanding (and recollection) of the historical context reinforces my conviction that the text of §2 should be “broadly and colloquially interpreted.” Carter v. Virginia, 321 U.S. 131, 141 (1944) (Frankfurter, J., concurring). Indeed, the fact that the Twenty-first Amendment was the only Amendment in our history to have been ratified by the people in state conventions, rather than by state legislatures, provides further reason to give its terms their ordinary meaning. Because the New York and Michigan laws regulate the “transportation or importation” of “intoxicating liquors” for “delivery or use therein,” they are exempt from dormant Commerce Clause scrutiny. What’s at stake in TWSRA v Blair? Granholm held that wineries can ship to consumers in the 50 states (dormant commerce clause) yet retailers can’t ship to anyone outside of the state? Privileges and Immunities Clause – Does this save the Granholm reading which incorporates the dormant commerce clause? In Tennessee Wine there are distinct issues where there is a circuit split. This case deals with the complex question of whether Granholm’s reach is limited to producers or extends to retailers and wholesalers and whether the duration of residency requirements are constitutional. Oral argument by Illinois Solicitor General David Franklin on behalf of the petitioner. Representing 34 states. This is a hard case to handicap: Justice Ruth Bader Ginsburg was absent, Chief Justice John Roberts said very little, and Justice Clarence Thomas did not say anything at all. Kagan and Justice Neil Gorsuch fretted aloud about the prospect that a ruling for Total Wine and the Ketchums would open the doors to new challenges – ……. Isn’t the next business model, Gorsuch continued, just to operate as the Amazon of liquor? John Roberts is considered an Institutionalist and he has been at odds with the conservative wing as of late (Thomas, Alito, Gorsuch) he is someone that considers his legacy as the Chief Justice. This might be a chance to guide his court towards altering the topography of the legal system. Chances are that Clarence Thomas has been chomping at the bit to reverse Granholm v. Heald and as the senior most conservative (who authored a minority opinion when he was a junior most conservative justice) he may be leading the charge. 4 Justices (Rule of Four) must have granted writ of cert – Clarence Thomas authored the dissenting opinion 14 years ago – while cert was issued when there were 8 justices (after Kennedy had retired) sitting. With another conservative joining after the fact the odds are stacked for a State’s Rights decision.